We don't have any cats but Nikolai loves to play with a couple of cute ones at our good friend's house. Unfortunately, I believe he is allergic to the cats since each time he gets close to one, his nose gets itchy. I have received many inquires via e-mails, messages and comments as to how Nikolai's lunches remains cute and not messed up at lunch time. For example, in this lunch, I glued the accents with honey or you can use also use sun butter, mayo, mustard, nutella or any thick condiments. This will usually help to keep the accents in place. I always pack his lunchbox in an insulated lunch bag which allows the lunchbox to lay flat. The Laptop Lunches tote is one of our favorites, Nikolai's laptop lunchbox fits nicely at the bottom and his drink bottle and an extra snack box fits the top section. Main compartment: Nature's Own whole wheat sandwich rounds for the cat's face. The ears are made from the corners of a piece of bread and some Colby cheese cut to triangle shapes. A small circle cut from bread with whiskers from nori and Colby cheese makes the nose. Candy eyes complete the face. Cheddar goldfish crackers. Bottom left: Organic baby carrots and cucumber sticks. Far right: Mozzarella string cheese. Cute kitty!! And love the colorful fish crackers too. Very cute kitty! 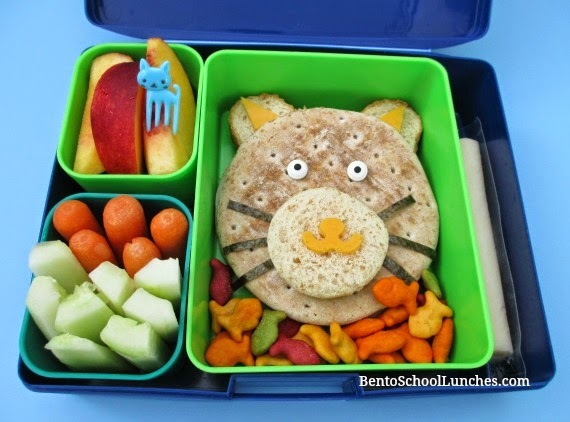 Love how the kitty has fish crackers to go with it, lovely theme!